As previously mentioned I have had the Ouya for about a week now and I have been disappointed. In the last couple of days several new games have been released and so I was hopeful. Here are my initial opinions of what I have tried. I should point out I have a very low tolerance for rubbish quality, poor interface design and inadequate tutorials or in game guidance about what to do. I have a life, I am not a teenager with endless hours to try things out, I have to be able to pick up a game, play it immediately and then go and do something else. This was pretty much a launch game and has been shown off in several places. It suffers from overscan problems on my screen, meaning some of the menus and instructions appear off of the screen. This makes playing and setting it up difficult so I have not given this a fair chance yet. I played through a couple of races and it looked OK but it's not fun having to struggle with the menus! First impressions last. I may or may not go back to this if they fix the menus! I was expecting more from this. Sadly the port was disappointing. The graphics appear in a window in the middle of the screen and are a bit too low resolution. That said, I can see the menus so I played on. Trouble is I got to a point where I could not find any way other than to die by being burnt to death by a big rat. There were no in game tutorials to help me past this point so I just stopped playing. I had high hopes for this being a well known series. The good news, everything worked and fitted the screen. Nice lead in to get you going. Trouble is, I am not a 6 year old any more so the style and game play was not to my taste! For those that like that sort of game, you probably already know what to expect and will find it fun. I had been waiting for this having seen the trailers and was excited to give it a go. The good news is they have done a good job of the interface to fit the screen and to work with the controllers. The tutorial section at the start is just right. It was clear what to do and the path through the game was evident. So far so good. The graphics look good as well. Not next gen AAA but plenty good enough for this genre. Think original half life but with improved textures. During the tutorial level I did struggle with the sensitivity of the controls. Before going in to the main level I tinkered with the sensitivity, which is the only adjustment. I got it a fraction better but it felt throughout the game that I was not fully in control. It's a duck behind cover and shoot type game, but I found that on the easy setting I could often walk up to the normal enemies and just shoot at point blank range. The turrets required hiding and a nice touch is that some of the cover can be destroyed so you have to be careful where you hide. Now for the problems. I found that aiming was difficult because the controller would often overshoot the target by a long way. Initially I thought it might be me but after some testing could show clearly that I could let go of the controls and they just ran on. In the worst cases the game got out of sync with my controls. I would press the controller to rotate then move forwards and nothing would happen then the character would spin and move while I was not touching the controls! With patience I put up with these glitches which could last for a minute at times. I was still able to complete the entire free level but I found myself compensating for the lag. Pulling the trigger early or deliberately aiming off to hit a target a moment latter. That is not how I like to play a modern shooter! For me this is still the most impressive game so far I've tried and I hope the controller problems can be sorted. I saw this advertised as coming to the Ouya. I had no idea what it was about but looked like a polished game so worth a try. This is another one where the interface has been correctly adjusted for the Ouya. Well done. There is a silly story to explain why you are a knight collecting muffins. Each level drops muffins and various creatures to avoid or shoot. Initially OK but once it got more active I found the lag from the controls and the overrun while moving too frustrating. The good news is that you restart very quickly after you die. Again, this is one for the youngsters and not my cup of tea. That's it for games. The only other thing I have installed is the XBMC media player. This has to be side loaded and there are plenty of tutorials to tell you how to do that. Apart from the Ouya web browser not having any indication of the state of your download it was fairly easy to get up and running. XBMC is a very polished App. It puts the rest of the Ouya to shame. It even includes overscan compensation so you can adjust the usable area to fit your screen. I found it confusing to find the right network protocol to work with my network storage but that was partly because you need to attach the storage and then on a completely different screen connect to a folder and add it to your catalogue. I didn't bother to read any instructions and still managed to get it to work. I could have saved myself some time by reading up on what I should have been doing. The good news, it works, I could play my videos and after the last Ouya update it stopped crashing when I tried to fast forward! XBMC works reliably. The only oddity is that despite its console background the controls only work with the D-Pad. I find the thumbstick much nicer to use but that does not work in XBMC at the moment. It's not all good news though. The video quality is not as good as the other media player I use, which is my Xbox 360. That was disappointing. It also had some jitter during playback. 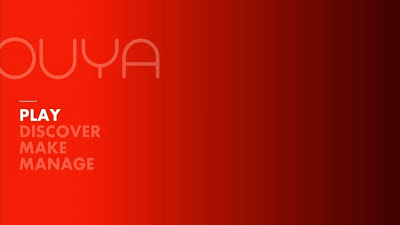 If I had nothing to compare it with the video would have been fine but as I have a better player I am unlikely to use the Ouya for video at the moment. My belief is that this is because this version of XBMC does not use any hardware acceleration. An Ouya specific version is being worked on and I have high hopes for that. All in all, so far I have been disappointed with what I have tried but I can clearly see there is potential. I just need to be patient. The Ouya has only been available for a few weeks and I have had mine about a week. 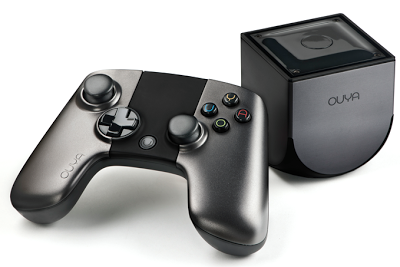 Being a Kickstarter investor in the Ouya I am keen to see this games console succeed. To cut a long story short, so far the Ouya has been disappointing. It shows promise but in my opinion has been released a little bit before it is ready. The biggest issue for me is the overscan problem. This is where some of the screen is clipped by the edges of the screen. Every screen is different and some screens will not have any overscan. For anyone working in TV or developing games for any other console, this is a well known issue. The solution used by both TV and games console manufacturers is to have a margin round the outer edge of the screen by 10% of the pixels. Nothing important is ever displayed in that 10% and all text is kept within the central 80% of the screen. Other games consoles, probably all except the Ouya, have restrictions enforced against the developers of games. If anything important is in that outer margin the game can not be distributed. The developers soon fix that problem. Ouya advertise how open they are and because of that I think, they have "shot themselves in the foot." Leaving it up to the developer to make decisions that spoil the games for some people! The standard XBMC media player which works on the Ouya allows you to set the visible limits of the screen and keeps all text within that. This works great. Sadly the vast majority of the initial crop of games on the Ouya have come from mobile phones and tablets which rarely if ever suffer overscan problems. The developers porting the apps are either ignorant of the problem or could not be bothered to fix it before releasing on the Ouya! This has left a lot of disappointed Ouya owners that cannot find games that they can play. Their frustration is taken out on the Ouya support forums! This is one of those tricky areas. I cannot prove if the lag comes from the hardware or the games themselves however it is very frustrating. All I can say is that in any of the fast action games I have played so far this becomes an issue. I have seen run on, where the character or object in a game keeps moving after I let go of the controller. I have seen continuous rotation, so the character spins when I am doing nothing and the worst is that I see the game play my key presses several seconds behind when I have pressed the keys. Again, I hope this is one that developers, as they get more familiar with the Ouya, will be able to overcome. A couple of other point while on controls. The touch pad is too vague and too fast to be of any use. I understand why it is there but it is nearly useless. So far the only manufacturing problem I have is that one key, left bumper, gets stuck on the controller housing. I may have to get a knife out to trim back some plastic! This is the last problem for now. Back to my previous point. It's just not finished. The front screen and the first level of sub menus are nice and clean and it is easy to find what you want. The Discover section initially had its foibles but Ouya improved those last week. The problems are in the Advance menu where you get to what is clearly a completely unmodified mobile phone implementation of the interface. Now with the overscan I have it means that many of the essential options, like deleting files, are inaccessible! There are probably other options I can't use but I don't know what they are because they are off my screen! This is one that clearly Ouya need to fix. I thought I should end on some positive points. I look forward to some better games coming out and for the fixable issues to be resolved.